Logan - 2 months old! Check him out! He is sitting up and holding his head very well! 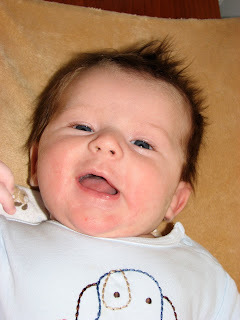 Logan is also cooing and smiling all the time. WE LOVE IT! He is starting to make the transition to 3 hours between feedings...and he still loves to sleep on his belly. According to our scale he weighs 13.5 POUNDS! 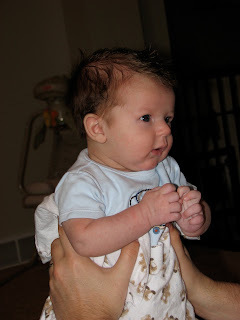 Zach only weighed 12.5 pounds at this age. Logan fits nicely into size 3-6 month clothes. 8 weeks old and he is one cutie patootie! Who do you think he looks more like - Dustin or Jen? The stool has little rubber non slide pads on the feet, so it won't "slip" on the hardwood floors (enhancement added by Dustin). This makes it difficult for Zach to push the stool where ever he wants. 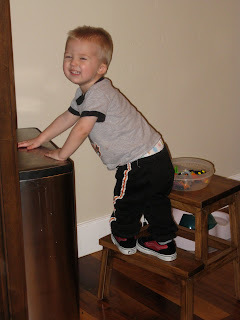 Zach was so determined to get that stool over to the pantry to get his fruit snack that he FIGURED OUT THAT IF YOU PUT NAPKINS UNDER THE STOOL LEGS THE STOOL GLIDES EASILY ON THE HARDWOOD FLOORS! Our TWO YEAR OLD figured this out on his own. 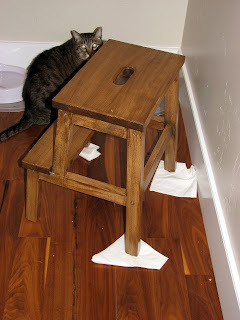 He got his own napkins from off the kitchen table and put them under the legs of the stool. He only managed to get 3 of the 4 legs done...and must have gotten bored, tired, or sent to bed before he finished. So do you think we have a future engineer amongst us? For Zach's birthday I bought some balloons. Zach's birthday was January 17th. This is what the balloons look like TODAY - A MONTH LATER. Yes - they are still floating! I can understand the over sized Mylar balloon still floating...but the latex balloons are still floating too! The "high float" paid extra for were only suppose to give the latex balloons and extra 24-48 hours of life. I would say a month of extra life was worth the extra pennies. I guess I know where to get balloons from now on! I just saw this commercial on TV and thought it was AWESOME! On Friday evening our neighbor and his little girl (3 year old) stopped by. They had a "gift" for Zach! 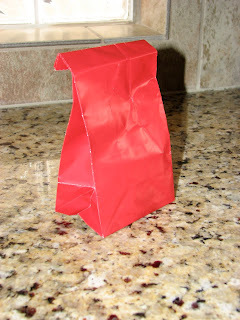 Check out what was inside. Isn't that the cutest Valentine a kid could ever get? Zach gave the girl a smile when she handed him the bag. It took him TWO DAYS to finish the cookie. Every once in a while he would start munching on it and then put it back in the red bag. Who can blame the kid - he wanted that Valentine to last!! Happy Valentines Day Jen! You're one HOT mamma!! On the way back from dropping off the chassis I realized we were about to hit 100K miles on the 4-runner (Not bad for a 10 year old Toyota!) so I grabbed the camera and took a quick picture as the odometer hit 100k.. My Dad (obviously un-nerved at seeing me taking pictures of the dashboard while going 65mph) said, "Why don't you pull over and I'll take a picture of you pointing at the odometer reading?" I said back to him, "nah its no big deal, I just figured Jen would like a picture for her scrapbook". Dustin took his Dad and Zach out for a "Cool Dudes Day" on Saturday.. Their choice of activities? Monster trucks at the Energy Solutions Center! :-) Dustin was able to get tickets from work so they could watch the action from the company suite.. Zach absolutely loved it.. He had plenty of space to run around and play with his cars and while not missing a single truck jumping over a stack of cars, or a tractor moving dirt around.. We even got to see Motorcycles doing high jumps! Whats not to love? Yes, the boys had a blast. Here are a few of the Monster trucks we got to see during Monster Jam 2o1o.. The green one was Zach's favorite.. Grave Digger! He even has a small one of his own that he hauls around the house with him. Is that not the cutest smile? He was so happy to see and hear everything around him. Here is one of many Motocross jumps from the show.. These guys were crazy! It was pretty common to hear Zach go "Whoa!!" or "Tractor!!" throughout the show.. This picture made me laugh though.. I caught Zach saying "Woah" and almost losing his candy in his mouth.. way funny. And you wonder why he said "Woah"? Poor Grave Digger flipped over on his last jump of the night! But you can see the driver to the bottom right of the picture waving.. Just another day at work! LOL! We'll be back again next year! Who can resist a good monster truck show! As we were walking out, Grandpa and Zach spotted this Maverick Big Rig.. Zach had to see it up close.. it was a sweet truck! Seriously? 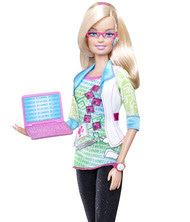 Nerdy glasses (pink none the less), a bluetooth headset and a pink laptop makes you a female computer engineer? Wow.....what does that make me then? I don't have nerdy glasses, a bluetooth headset OR a pink laptop....AND I have an engineering college degree. This is a statement from our insurance company for Logan's hospital when he was born (just the hospital stay). The hospital charged $5104.54 - the insurance says no...we will pay our negotiated rate of $1203.41. The hospital says okay. That is a difference of $3901.13!!! What blows me away about this is if you DON'T have health insurance and have to pay for it out of pocket 100% - the hospital would charge you the $5104.54...something just isn't right about that! Today was the first day in a LONG TIME that BOTH the kids took a nap at the same time. Jen kept peeking in on them to see how they were doing...and caught a glimpse of some interesting sleeping positions. Zach has been sleeping the wrong way in his bed lately. Logan sleeping on his stomach (I know...a no no...but he sleeps SO GOOD when he is on his tummy!) - with his FACE DOWN and nose smashed. Jen bought a step stool for the kids at IKEA several months ago. It is one of those that you put together and stain/paint yourself. She figured this would be a good project for Dustin when he was looking for something to do. In fact.. some of you are probably already thinking back to that time in grade school hanging out with your friends drinking soda and downing entire packages of pop rocks! Right? Ok.. well at least that's what Dustin was thinking about tonight when he pulled the package out of the cabinet. Pop Rocks = Fun! When Dustin threw in the first spoonful, Zach heard **Pop!**Pop!**Pop! and his eyes got huge! He started to giggle.. and lunged for the spoon.. After that I'm sure you know how things went down..
Dustin and Zach were laughing like crazy and making crackling noises in eachothers ears.. Pretty fun. Jen - I want to stop drinking soda for the month of February. We should also probably stop eating pizza since it hurts your stomach. Dustin - I want us to work out. Jen - Okay, lets do it. So on Friday night we decided to get pizza from one of our favorite places "The Pie". We ate pizza Friday night, leftovers Saturday for breakfast and leftovers Sunday for lunch. We also polished off the rest of the Diet Pepsi in the house. 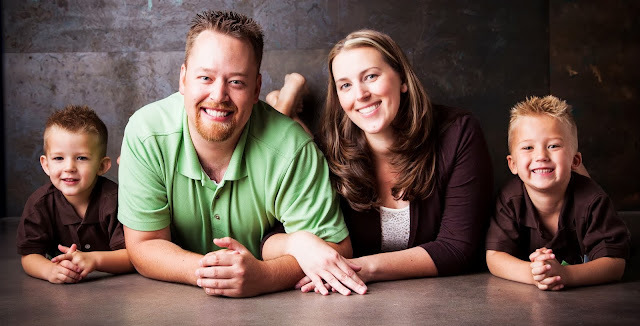 Day #1 of the month of February - no pizza and no diet pepsi.....Dustin went to the gym at lunchtime and Jen has a massive headache from caffeine withdrawal!